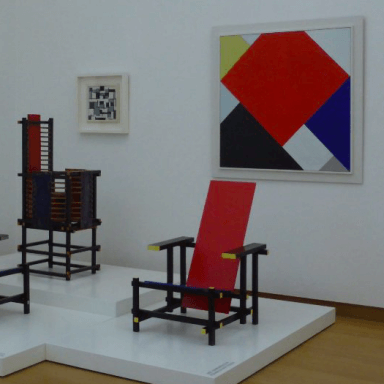 For lovers of modern art and design, the Stedelijk Museum really is the place to be! I hadn’t been for a number of years, and it was high time for a visit. I love museums, and in recent years my love of modern art has grown. It thought it would be interesting to see how my experience of the Stedelijk Museum had developed. Even from the outside, you know what the Stedelijk museum contains! It is impossible to miss the sparkling white building nestled between the more traditional Amsterdam facades. The minute this structure comes into view, you know it contains modern art. It might not be to everyone’s taste, but personally I think that the overall look is incredibly beautiful. On the inside the Stedelijk Museum is similarly modern and sleek. Everything looks new and fresh. Even the cash desks have a unique design. I find that the methods used to merge the old premises with the new are particularly special. Traditional and modern flow together, alongside, under and over each other in marvelous ways. In fact, the architecture alone is reason enough to pay a visit. As I had already booked my tickets online we were able to walk straight in, which was great as the lines at the ticket desks were quite long. If you have included the Stedelijk Museum in your list of ‘must-sees’, I recommend you book your tickets beforehand here. An assimilation of old and new at the Stedelijk Museum. We had already reserved a guided tour in order to be better informed about the art this museum contains. For those less knowledgeable about modern art, this is a worthwhile and interesting addition. By getting some background information from a trained tour guide beforehand, we were then able to go on to explore and enjoy the exhibits with a fresh eye. If you decide not to use a museum tour guide, you can also use the free audio tour or just let your feet take you where they will. The museum houses collections of modern art, design and photography. 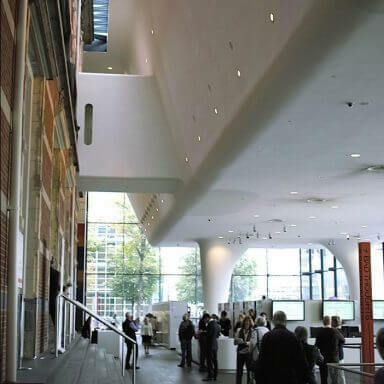 In the Stedelijk Museum you will find many modern day artistic trends and movements including The Amsterdam School, CoBrA, pop art and Bauhaus. The artists themselves are too numerous to add here, but the more famous names include Picasso, Karel Appel, Mondrian and Cézanne. My visit was a complete feast for the eye, and the collections from world-renowned artists was a privilege to encounter. The various styles and techniques mean that each piece should be given enough time to properly savour the experience. This museum constantly hosts a range of exhibitions, which makes it extremely interesting. It incorporates a rich combination of works from painters and artists including Karel Appel, Rietveld, Mondriaan, Van Gogh and other modern artists. Very comprehensive! The museum often hosts temporary exhibitions to promote a wide range of artists. 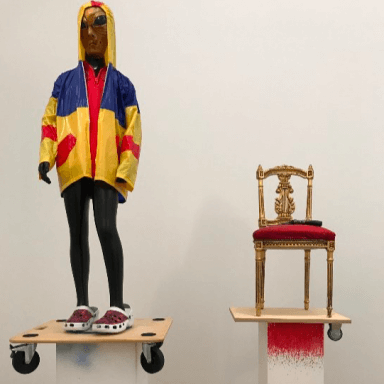 These exhibitions are constantly swapped. When a new exhibition is being set up, that particular space will be temporarily closed to the public. It is therefore possible that areas of the museum are not accessible, even when you have paid the full entrance fee. If you are interested in visiting a temporary exhibition, I advise you to check the museum website beforehand so that you are sure it will be open for public viewing during your visit. Art to keep your brain whirring; delightful. I had already read that it would be possible to eat lunch or dinner at Restaurant Stedelijk, so we decided to try it out! We enjoyed a light lunch on the terrace. Some dishes are fairly expensive, but there is plenty of choice with a range of prices; something for every budget. Of course, you are also eating on a gorgeous, private terrace in the centre of town. And the seating is, naturally, also beautifully designed! 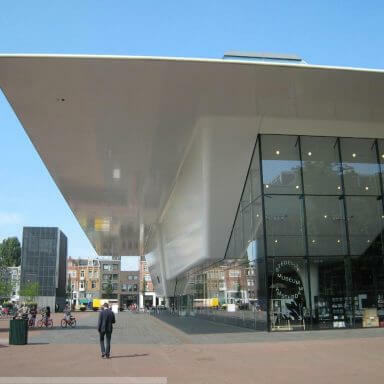 The Stedelijk museum is located at Museumplein 10, 1071 DJ Amsterdam. This square is in central Amsterdam, and the best way to get there is by tram. You might want to drive, taking advantage of the museum parking located under the square, but it is not cheap. If you have decided to spend the day in or near this area, I recommend you park outside the city centre and use public transport. You will save a lot of money. Want to save even more? Buy an online ticket to the museum here; it’s cheaper than buying one at the museum! Modern art? So such collections actually exist? Well then. Gotta start packing! 652 visitors rated Stedelijk Museum average 4.69 stars out of 5.